CFR’s Global Monetary Policy Tracker compiles data from 54 countries around the world to highlight significant global trends in monetary policy. Who is tightening policy? Who is loosening policy? And what is the policy stance of the world as a whole? The tracker highlights significant global trends in monetary policy. For example, central banks around the world eased policy in response to the financial crisis in late 2007 and 2008. But by mid-2011 many had reversed course—with the U.S. Federal Reserve and Bank of England as significant exceptions. Today, the tracker highlights the unprecedented level of policy divergence, with the Fed raising rates while the most of the rest of the world cuts them. The tracker covers fifty-four large countries—mainly those that target inflation in some manner. Tightening policy is indicated in red, loosening in blue. The more a country has raised (lowered) rates, in percentage points, from the most recent trough (peak) in its policy rate, the darker the shade of red (blue). For each country, its growth rate, inflation rate, central bank policy interest rate, and date of the most recent rate-move can be seen by hovering the mouse over (or tapping) it. Generally, the policy rate target is the overnight interbank rate, with exceptions indicated. If the country is currently engaged in some form of quantitative easing (QE), this is also indicated. You can change the data month and year at the very top of the tracker, allowing you to see how policy has shifted over time. Below the map you can filter out countries with very low or very high policy rates; the latter allows you to exclude countries with unusually high inflation rates (invariably emerging markets). 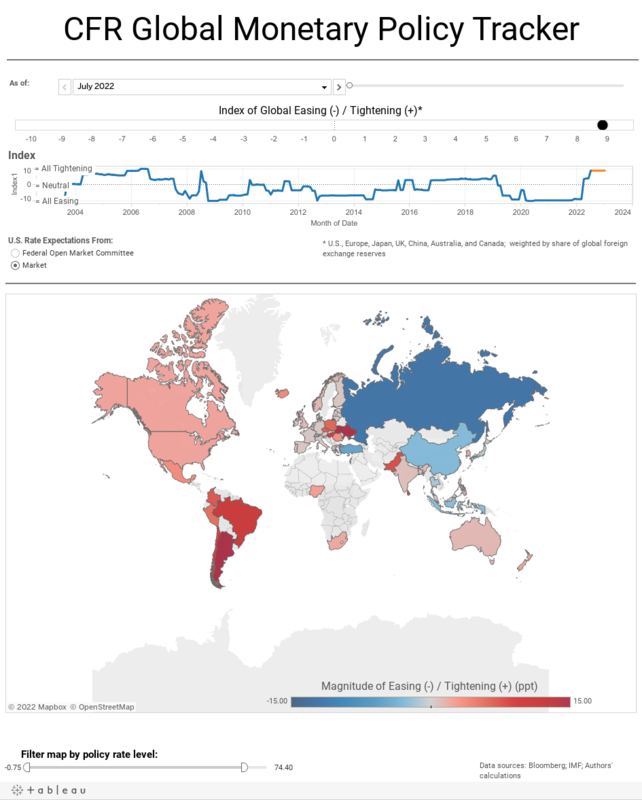 The summary “Index of Global Tightening or Easing” color-bar can be found just above the map. The index ranges from -10 (dark blue) to 10 (dark red), where -10 indicates that all countries are easing (as in late 2008) and 10 indicates that all are tightening (as in mid-2006). In generating the index value at any point in time, each country’s monetary policy stance is weighted by its currency’s share of global foreign exchange reserves. (The United States, therefore, receives a 61 percent weighting.) A country is said to be easing (tightening) policy if it has cut (raised) rates in the past three months, or is expected to do so in the next three months. A country is also said to be easing if it is engaged in QE. The line graph below the color-bar shows how the index has moved over time. On the far right of the graph, future rate-move expectations are used. You can choose whether to see Fed or market expectations. Please also visit our Sovereign Risk Tracker and Central Bank Currency Swaps Tracker.